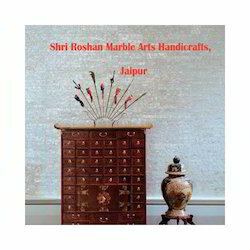 The beautiful designs depicting, birds, animals, flowers have been engraved in marble and then studded with colorful semi precious stones, that come out to be a great art work. In the art work at this temple, one can find life everywhere in shape of human beings, birds, animals and flowers. Size : Custom Sizes from 2" x 2" to 96"
This magnificent Black MOP tile is carved in beautiful circular, unsymmetrical square and rhombus. Featuring an elegant base and off white, brown and blue color, these tiles exhibits elaborative patterns. 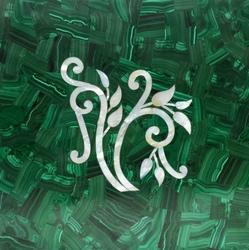 This piece of tile is a wonderful for complimenting your home.